Cuttlebug & Embossing Questions Answered! My April trip to HSN was such a fun and memorable one, and it’s all thanks to YOU! To everyone who called in, reached out on social media, tuned in and ordered, please know how truly grateful I am for your constant support of our brand! This month was the first time the Cuttlebug returned to HSN since January, and we’ve been getting so many great questions about our future Cuttlebug and embossing folder offerings that I wanted to answer them all in one place for you. I hope this helps! When will the Anna Griffin Cuttlebug be back on HSN again? July 11th! There will be a new offer of a machine with a “mega bundle” of the original folders paired with the Elegant Arrangements bundle. You will also be able to buy just the regular machine by itself. Will I be able to buy any embossing folders sets separately again soon? We will be offering the Inspiring Impressions bundle from the June/July autoship separately for purchase in July. If I bought the new Embossing Folders Storage Box, will the extra sleeves be available for purchase soon? The extra sleeves will be available again in July plus many more items that you have requested to see again. Check back here for more details and product sneak peeks! Are the new storage sleeves updated to fit the bigger embossing folders? Yes, the new Embossing Folder Storage box sleeves are larger than the original and hold both the A7 and A2 embossing folders and borders in the pockets. If you ordered the original box – use it for your A2 folders and borders. Will the embossing folder storage boxes ever be available in the Olivia and Camilla patterns? We don’t have plans to add those patterns at this time. There will be stamp storage binders in those patterns in September. Is there any chance that someday there will be an Anna Griffin Cricut cartridge? Yes! I am excited to announce that 2 Anna Griffin Christmas project cartridges will be available for purchase on HSN in September. What else can we look forward to in July? There will be lots of new products as I will have 4 shows on the 11th. I am most excited about the new Die Cutting Die sets that I’ve designed for use with the Cuttlebug. 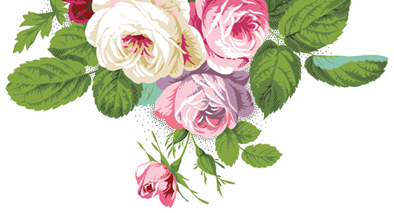 There are 2 products – a Flourish bundle of 3 dies and a Flowers bundle of 3 dies. They cut and emboss beautifully! I hope I’ve answered your questions! If not, post them below. Please feel free to share your Cuttlebug projects on our Facebook page anytime so I can see what you’re creating! I purchased part of your new office supply items from HSN, but I missed out on the 4 piece paper storage in the Camilla Floral. Are you going to bring that back, so I can complete my set. I missed getting your new cuttlebug when you were on hsn. I’ll be watching hope I don’t miss it in July. I also hope you’ll have the auto ship with different stencils. I love my Anna Griffin Cuttlebug! It is beautiful and so are the Embossing folders . I am so excited about the new Die Cuts got the Cuttlebug . Can hardly wait to get them! thanks Anna & Provo Craft for superior products. I just received my christmas and birthday kits and I just love them. I have already put together 20 Christmas cards nd 10 birthday cards. They are beautiful. I was so excited about your big scrapbook sale, as were so many others that your website crashed! But, I spent 4 hours online trying to place my order after I was finally able to get on it, took forever for the order but it finally went through. Now if that isn’t AG dedication I don’t know what is! Glad to see it is up and running smoothly now, but so much was sold out. Glad I did my marathon wait. I agree with Penny. Anna is so generous and kind with what she gives us, I think people ought to be patient and kind back. I literally sat at my computer all day trying to get into the sight. I got in twice and was booted out both times I tried to check out. Even though I want these products very much at such a good price, I kept thinking, all day, how happy I was for Anna that she had so many followers and what a success this offer, of another kindness from her, was. She has worked hard to bring us wonderful products and is always so generous with the amounts and prices and has touched our lives in so many ways, I think we owe her some slack and respect. Thanks Anna for the the person you are and all you do for us. Hello Anna: I know yesterday had to be stressful for you and your staff. While I understand that some people are disappointed, this is just a small blip on the radar screen in the grand scheme of things. I hope everyone will put it in perspective. It’s good of you to do a sale at all; we appreciate all your efforts and your wonderful products. Don’t stress over this. We already have so much! other dies workable with the cuttlebug? Can’t wait for this friday and July 11. Love your stuff. I am am affid card maker. I make them for the local Rescue Mission shelters. Thank you for all your beautiful work. Hello Miss Anna & Co! I’ve read your newsletter and I am looking forward to the 24th! I have a question re: the Elegant Arrangements embossing folders. You mentioned that there would be a “mega” bundle available with the original folders that were offered in January and also that you would be able to purchase the Cuttlebug by itself. Will the Elegant Arrangements folders be available as a group by themselves? It sounds as if they are different from the original autoship received with the January release…Just need a little clarification, I’m not sure I read your entry correctly! I also agree with Patty’s comment about being spoiled regarding your products! I truly have a serious addiction! Also for anyone reading this that has not signed up for Anna’s newsletter, you can do so by going to the home page of her website and in the bottom right hand corner you will be able to sign up! Totally worth it! You will be glad you did! I just cannot hardly wait until July. Sounds like you have so much wonderful stuff coming out this year. Look forward to making lots of new purchases. Anna I love your products. You are such an inspiration. I bought you new cuttlebug when it was first release even though I had a cuttlebug. I see you are doing another show in July on HSN will we be able to buy your new embossing folders and the mega bundle?? It would be nice since a lot of us just purchased the machine through HSN. Looking forward to July show. Anna, your hard work is so very appreciated. I would like to respectfully request that you do even more by bringing in greater quantities of your products. They sell out so quickly. I hope you will bring back some of your kits: Banners Clear Stamp Set / Heartfelt Sentiments Card Liners / MAKE YOUR OWN PAPER FLOWERS / Metallic Card Layers. Once again, that you for everything including sharing your talent with the world! Like Vivian Echezarreta and so many other fans, I’ve enjoyed your designs from paper engineering to making ribbon flowers. You always have something wonderful to add to my paper crafting supplies. I am so looking forward to getting the die sets for the cuttlebug. By the way my four year old granddaughter loves to turn the crank on the cuttlebug and she uses her embossed papers on the cards shr makes! I’m not as skilled as you, when it comes to cutting. I’m afraid I’m looking for an easier way to get similar results. Anna, I have been with you for a long, long time. In fact, I still use rubber stanps that are at least ten years old. And, they are still perfect. I cannot count the number of papers, embellishments, and now, card kits. I am hooked. I am looking forward to your Cricut Christmas cartridges. All of the products you have designed and offered have been beautiful. Thank you, for just being your creative self and allowing us to be creative with you. Happy Mothers Day, Anna, and to all the mothers out there. My hubby got me another set of Anna’s storage boxes! Yippee! Have a wonderful day, everyone! Can you please tell me what autoship is regarding the embossing folders and what one has to do to participate in that and how it works. I have not been able to find the folders you are mentioning. Please, please tell me your Doily Stamp Kit will be available again…??? Hoping all is well with you and yours! I was doing a little organizing when I realized that I need a beautiful Anna Griffin Design Cuttlebug Storage Container for my Anna Griffin Golden Cuttlebug! One that matches the embossing folders storage box! What do you think? Hello Anna: I’ve been embossing away on my Cuttlebug which I was fortunate to get in January as a Today’s Special. It works so well and the cards that are made with it are just exquisite. I have a question. Have you ever considered pairing the 3-D sentiment stickers together with the interior sentiments for cards in kits for different occasion cards? For example, I find that I use so many sympathy cards (I’m getting to that age unfortunately). It would be so great either to have a full card kit dedicated to sympathy/get well, OR have just the interior verses and the 3-D’s paired specifically for that event. You could do a birthday one, a sympathy/get well one, a congratulations one, thank you, etc. That way, we could make generic cards and then customize them with the sticker sentiment and interior verse as we need them. I think it would be a great seller, especially since it’s Anna Griffin! As always, I love your products. All your fans appreciate you and your staff more than you know. Kind regards from Jarrettsville, Maryland. Dear Anna, I received my doily stamps and stencil and am extremely happy with them. I did not purchase the self inking stamp because I understood from what I saw online (before the broadcast), that I could use the stencil with an acrylic block. I was further delighted to see that the stamp images are taken from parts of your lace stamp set images, which I also have. I look forward to coordinating these in original ways. Congratulations on marketing strategies that also benefit users! Thank You Anna! I ordered my Cuttlebug in March not knowing you would have the auto-ship in April. That’s ok, I’ll buy the folders each time you have them available. I was afraid to wait! I love your products and have so many of them. During Spring Break I finished my Christmas 2012 album–an Anna Griffin instant Christmas album. I had to add some pages, but I just pulled from my AG stash of papers and they fit right in. Keep bringing us your beautiful products. I’ll be watching in July. Yay! School will be out and I can watch your shows live! So glad you took time to address the questions asked, thank you! Loved reading your update and I, once again, can’t wait! I don’t have a Cricut machine but I am seriously contemplating getting one solely because of your signature cartridge that will be offered! Here’s looking forward to your new creations! Another long-time fan and customer here. Everyone loves receiving a card made from Anna Griffin elements as much as I enjoy making them. Like Ronny and Sharon, I also missed out on the March 2013 HSN Auto Delivery Cuttlebug embossing folders shipment because my order was canceled (not by me!) and was unavailable when I tried to have it reinstated. I’m also hoping there will be another storage box for embossing folders offered, since I missed out on that. I am SO looking forward to A.G. cutting dies! I have been practically holding my breath in hopes you would offer them! Will there be more card stock offered for embossing? I especially like the effect of sanding the embossed designs. Thanks for all your lovely products. Any chance some of the QVC UK items will be available here in the USA? Some of them look different than what I’ve seen on HSN. -I am bringing more folders, dies and stamp storage to QVC-UK on August 22nd and 23rd! -A special Christmas set of embossing folders will be available for purchase separately for my September 17th visit to HSN, but they are different from the autoship bundle. -The Elegant Arrangements embossing folder bundle will be available for purchase separately on July 11th! I am also a very very long time fan. I have most of your beautiful products and actually did take every Elegant Paper Crafting class that you produced. I have only one simple request. I would love to have either a blank or embossing ink pad for my self-inking stamper. I think a heat embossed dolie would be beautiful. I am looking forward to July and to see the new products. I had the exact same experience as Ronny and would love to get the March shipment. I love everything you do! continuing to offer wonderful products, showing us different ways to use them, and making us all look like creative geniuses. Hi Anna, I just barely got in on your Cuttlebug bundle (Auto-ship) before it sold out again in April. This is my first Anna Griffin purchase and I can’t tell you how excited I am. When it arrived I opened the box and embossed using every single folder and border. They are so beautiful!!!! I just made a gorgeous Anniversary card for a friend. Sorry I’m not on Facebook to post it. I was just thinking today how fabulous it would be if you had dies too and I came to your website and found you are going to have Die sets available in July. AWESOME! I can’t wait! I enjoy watching your shows on HSN. You don’t just sell the product you actually teach us how to use it in ways we might not even think of. Thank you for sharing your creativity and providing inspiration! Hi Anna – I can’t tell you how excited I am about your upcoming shows in July. I’m so looking forward to purchasing the new embossing folders since I bought the Cuttlebug in April before the autoship was offered. By the time I got the Cuttlebug, it was too late to return to be able to purchase the autoship. I love all your products and have many projects completed and to be completed. Can’t wait to purchase more. Thanks for all your replies to all of our questions and keep up your beautiful work. Looking forward to July. Love your products. I wish you would start making some of them in the USA to help fellow Americans. Have you approached any U.S. companies to see if they can compete with the overseas manufacturers? What fun it would be to see your products at work every day! OMG I cannot til July! Hi Anna, I’m another one of your super fans. Yep I still have and watch my recordings of you on Sandy G, DIY show. You showed me how to make beautiful weaved pages, how to preserve laurel leafs, and made those mini embroidered flowers on a layout. Love all your stuff, Thank you! Hi Anna, I believe you mentioned you may publish a new idea book soon. Can you give us any updates about that? Love all the samples you share on HSN. Thanks for the inspiration! 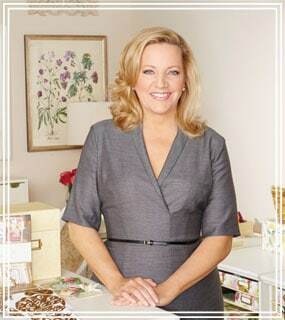 I would like to thank YOU Anna with my heartfelt wishes for choosing my story in your Camilla storage give away. On Wednesday my heart skipped a beat when I opened the cartons and saw the beautiful Camilla boxes. I felt like it was my Birthday, Mother’s Day and Christmas all combined into this wonderful magical moment! The boxes are stunningly beautiful in appearance and most useful for organization and the workmanship is true Anna Griffin quality! I have been busy going through all of my Anna Griffin products that I have collected for ten years and it has been such a delight to place your much loved products in these storage boxes. Camilla’s lovely pink floral design on the boxes compliment the baby blue walls in my craft room so nicely. They are just the most perfect accessories for any craft room. Even though it has been snowing here today (yes snowing in May!!!) my craft room has the gorgeous look and feel of springtime with Camilla proudly displayed! Thank YOU Anna from the bottom of my heart for choosing me as the winner. YOU have a most generous heart! I will forever treasure your Camilla storage collection and my being more organized makes my husband happy too (smile)… I know all of our crafting friends who purchased your storage pieces will be overjoyed when they receive their orders. God’s many Blessings of continued success for your wonderful business!